With Isabel Briggs Myers' publication of the Myers-Briggs Type Indicator in 1962, followed in 1978 by the David Kiersey and Marilyn Bates book, Please Understand Me, a tremendous new interest in the differences in human personality has taken place. The possiblity of a close connection between personality types and prayer and spirituality was conjectured by many persons. There has been much discussion on the topic, but almost nothing has been published. The present volume is among the first in print on the relationship between human temperament and prayer. The conclusions in this book are based on a Prayer Project conducted throughout 1982 with more than four hundred participants from all over the United States and even from Canada and Australia. The recommendations for the different forms of prayer appropriate for the different temperaments and personality types have been tested in a number of workshops, in parish retreats, and in spiritual direction of numerous persons. Without claiming to be the last word that can be said on this subject of prayer and temperament, the authors now offer their findings and conclusions to a wider audience. It is hoped that many others will find the same help to their prayer life and growth in spirituality that hundreds of other women and men have received. Monsignor Chester P. Michael, a Roman Catholic priest, has devoted a substantial part of his priestly ministry since ordination in 1942 to spiritual direction, preached retreats, and workshops on prayer and spirituality. A student of Jungian psychology since studies at Notre Dame University in 1950s, he received a Doctorate in Sacred Theology in 1975 from St. Mary's University in Baltimore. In addition to the present volume, he has co-authored "Arise: A Christian Psychology of Love," and has written and published "The Open Door," a quarterly bulletin on spirituality, theology, scripture, and psychology. An earlier book, "The New Day of Christianity," is currently out of print. If there is one book that has informed the way that I create worship, it is this one. I am an NF personality type, and if I did not understand the differences, I would assume that all worship and prayer should be worship and prayer that fits my temperament. However, as a leader, I would be missing 3/4 of the world's needs. Therefore, the concept of considering temperaments when making decisions both about my sermons and the worship experience itself, is an integral part of my Sunday duties. On a personal note, I have frequently used the NF prayer suggestions for my own prayer life, but have used the other suggestions on the other types to help me to explore Scripture passages in ways that will help me to speak to a wider audience. Recommended for anyone leading a prayer group. The author presents a sound review on the different temperaments according to the MBTI. I have used this book over the past ten years through personal insight and application. I am quick to recommend it to others who appear stuck in their spiritual formation journey. A great resource to enable the reader to find a prayer life that is neither forced or false. 5.0 out of 5 starsA great tool for prayer life. This book was prescribed through a Benedictine Oblate Program I am a part of over the next two years. It’s a great tool, and I highly recommend. Read it all the way through, then come back to the sections that you really need to dig deep into. 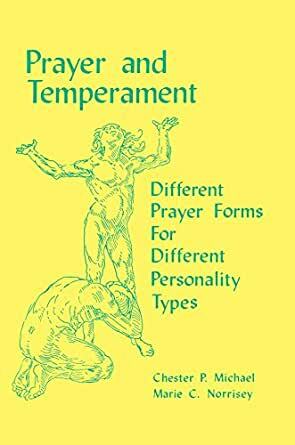 A classic about prayer that fits your personality type, but also suggests broadening your prayer life by trying one of the types that is not yours, especially during Advent or Lent. 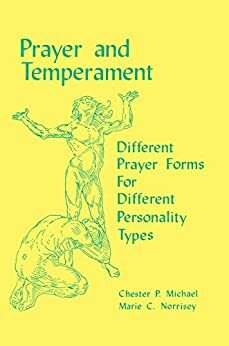 I found this book to be very insightful into personality types and how each relates to prayer. I tried the prayer type recommended for my personality type and found myself moved to tears as I communed with God. This book also helped me to understand other personality types better. The only reason that I don't give it a full 5 stars is that it is written from a Catholic viewpoint, and there were some references in the book that Catholics would know about, but non-Catholics would not, and these references were not explained very well, if at all. But if you can get past that little glitch, this book is well worth reading.